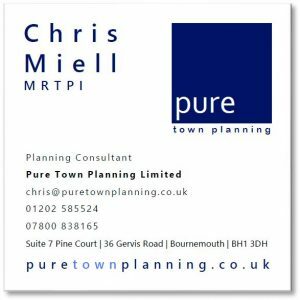 Town planning consultant at Pure Town Planning and Chartered Town Planner. Chris is an enthusiastic Chartered Town Planner who enjoys working in the dynamic and ever changing world of planning (see our news pages for the latest updates). He uses his mix of public and private sector experience to give clients the upper hand in the planning process, where he prefers to negotiate and work with local planning authorities to achieve mutually agreeable schemes. 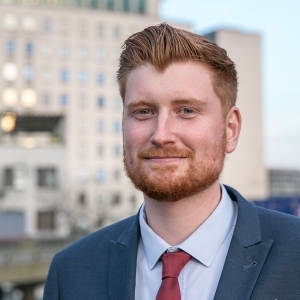 Chris was born and educated in Bristol where he attained a First-Class BA (Hons) degree in Town and County Planning and a Masters in Planning with Urban Design at the University of the West of England (UWE). Upon graduating from UWE in 2012, Chris moved to Dorset and began working as a Planning Officer for the Shared Services Partnership between Weymouth & Portland Borough Council and West Dorset District Council where he covered a wide ranging area that stretched from Portland to Sherborne and encompassed all the places in between including Weymouth, Dorchester, Bridport and Beaminster. Whilst working in the public sector, Chris gained a thorough understanding of the planning system and its various quirks and complexities. He has experience working on all types of planning applications from small scale planning, commercial and advertisement applications to complex listed building consents. Most recently Chris has worked on a wide range of prior approval applications in Dorset and has an excellent knowledge of the General Permitted Development Order (GPDO). Chris lives in Weymouth and when he isn’t busy helping clients secure planning permission he enjoys nothing more than playing a round of golf. So if you are in that part of Dorset and you find a Pure Town Planning golf ball (yes we do have those) in the rough, it was probably Chris having a bad day on the course.